This is an extra board clear for warlocks, I think this is flying under the radar. If you get DOOM! or Twisting Nether then your opponent gets completely rekt. I agree, I think people are undervaluing this card. It's obvious that some classes will be a lot more beneficial to play this with and sometimes it will cast crap, but other times it may win you the game. A lot of cards won't matter if you don't choose the target as they're limited to enemies or don't do anything directly that can be harmful (secrets, AOE's, Draw, etc.) Is it great? 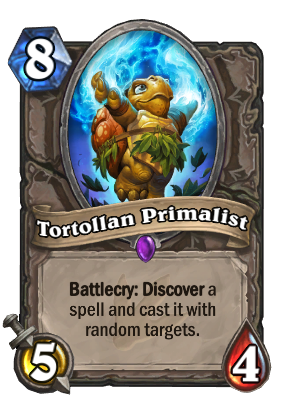 Probably not but it's a 1 shot Yogg with Discover, which means if you like that play style then you'll probably find a home for this. Pretty good in evolve chamman. Might actually see fringe play if control / late mid range hunter is a thing. Yes the card by itself is crap but getting Call of the Wild as an option gives you an 8 mana Call of the Wild + a 5/4 which is insane. Even with less optimal situations, non target spells like Multi-Shot, Animal Companion, Deadly Shot, Unleash the Hounds, any secret, Flare, Tracking, Infest or even Smuggler's Crate if you're holding a beast, they are all actually decent. Granted it isn't helpful when you get a targeted spell they are much rarer for hunter with potential duds (could still RNG gamble in a pinch) with Arcane Shot, Hunter's Mark, Kill Command, On the Hunt and Explosive Shot being the only 5 potential bad picks. Getting a 4/5 for 4 is the curve play, so to get real value you need Multi-Shot or Call of the Wild to get gaurenteed value with a secret being sub optimal but not horrible for the chance to get call of the wild. This will widely depend on the rest of the set reveals which i'll edit for. Yes this card isn't amazing or even that good but it's far from Dust. Because of non target spells there's potential for this card. If this was a 4/5 would be pretty nice in priest because it wouldnt shadow word death itself. Compared to mage 554, you could choose which card to be used to destroy the casting minion, that's awesome! yhea when i first saw this card i thought it was not that good when compared to noggenfogger and servant of yogg. the big thing people have to keep in mind with this card is that unlike servant where the spell is completely random, the spells that show up with primalist will only be spells for the class they are in. so that actually makes this a decent mage card because most of the spells you can discover will not be burn spells like fireball, so the chance that you can get a bored clear or secret or card draw will be much better and those cards will not blow up on you. i will say however, if you are really behind on the bored and need a bored clear right now other wise you are dead, this card will be very bad in that situation unless you get really lucky and you get a bored clear as an option. edit: actually primalist is like a worse Ethereal Conjurer for every class but still better in mage. and conjurer is rotating out. This is playable to Mage only. The fact that it is a discover effect will often cast Flamestrike, Blizzard, Greater Arcane Missiles and Cabalist's Tome. Frost Nova and Arcane Intellect are also decent for obvious reasons. Don't forget all the secrets! Okay, so you can play this card hoping to discover a powerful draw (like a cabalist's tome), a powerful board clear (flamestrike) or a secret. But if that's the sole reason to play it, as any single target spell you discover is too unreliable to cast, why play this card instead of the draw/clear you want in the first place?... I don't like it at all, huge cost, very high risk and low reward. 8 mana 1/1 beast for mage? Amazing synergy! Wait a minute! This is NEUTRAL card ok? So, does it mean you can discover ANY spell from ANY class? Am i right? I assume it will be similar to Jeweled Scarab in the sense that you can only discover cards from your own class, which actually makes it waaay better than if it were all classes' spells. This guy is likely only good when playing Mage, since you have a high likelihood of pulling high-value spells that are inherently beneficial to you in the card text. No... Discover rules were clear when the mechanic was first introduced. There are some exceptions like Hydrologist. Discover will always give your either neutral or your current hero class cards. Since there aren't any neutral spells yet, this will always give you your current hero class spells. If Hydrologist finds its way on a Non-secret class like Shaman, it will discover Paladin secrets. No. He is saying it will discover secrets of the class that plays it. If it is a class without secrets they will get pally secrets.